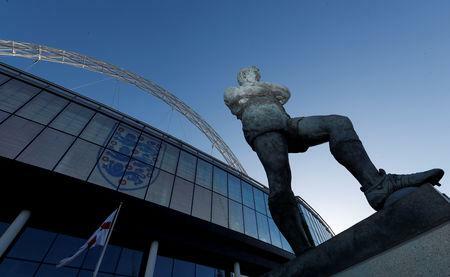 LONDON (Reuters) - A proposed £600 million sale of Wembley stadium that would have helped fund grass roots football in England collapsed because of "old men" who are "living in the past", according to former Football Association chairman Greg Dyke. He blamed opposition from the FA Council for causing Shahid Khan, the owner of Premier League club Fulham and the Jacksonville Jaguars NFL team, to withdraw his offer to buy the iconic national stadium. The Council, which has almost 130 mostly male members, should not have been making the decision anyway, said Dyke, who was FA chairman from 2013 to 2016. "If I'd been chairman, I would have said it is the (FA) board's decision," he told the BBC's Sportsweek programme on Sunday. "I don't think the council is equipped to make this decision -- that is what the FA board is for. "The council is living in the past, as it always has done. If you want to have a step change in grassroots facilities in this country you need this sort of money to be spent. "It's bizarre that the old men of the FA Council have stopped this." Khan made his offer in April and the full FA Council was to have voted on whether to accept it on Oct. 24. However, on Wednesday the FA's chief executive Martin Glenn said Khan had withdrawn his offer. "At a recent meeting with Mr Khan he expressed to us that, without stronger support from within the game, his offer is being seen as more divisive than it was anticipated to be and has decided to withdraw his proposal," Glenn said in a statement.